Choosing the right design of doors for your property can be a challenging task. While you want your door to be stylish and to complement the exterior of your property, you also want to choose a door that is safe, secure and thermally efficient. A good front door should last you decades, which is why you should ensure that the door you choose is the best quality and design for your home. Below we share a few tips on choosing the right door design for your property. When choosing a front door for your property, it is important that you choose a type of door that both suits and complements the exterior of your house. There are a range of different doors that you can choose from. Below, the first two options are ideal for front and back doors, and the final two are ideal for the back of a house or a garden door. Composite doors are made up of a combination of different materials. Instead of being composed of one single material (such as uPVC or wood), composite doors are composed of a mix, such as timber, glass reinforced plastic and uPVC. The combination of different materials results in a strong and sturdy door, ruling out common flaws experienced in singular material doors. Composite doors are resistant to seasonal changes and harsh weather, making them ideal all year round. These types of doors have an insulating foam core, unlike traditional wooden doors, meaning that they have a far higher thermal resistance and are more energy efficient for your home. 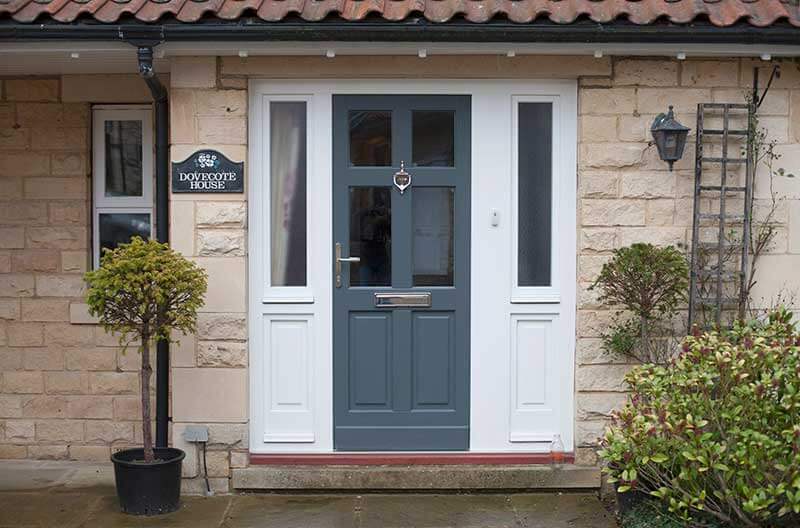 In terms of style, composite doors are ideal for the front entrance of almost any home; they are designed to look like wooden doors, but they won’t fade and can be wiped down easily to clean. 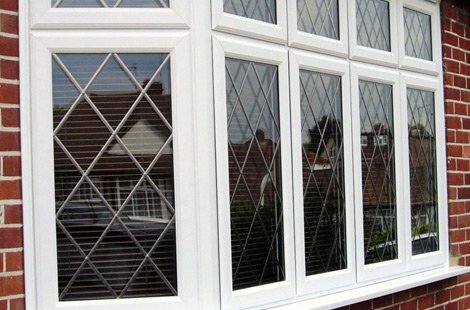 uPVC (unplasticized polyvinyl chloride) is ideal for both front and back doors. Strong, sturdy and easy to maintain, uPVC doors are low cost yet high quality which makes them the ideal option for those on a budget. This type of door is available in different wood grain effects and various different designs. Again, uPVC doors are water resistant and effectively retain both heat and cool air in a home. They are more suitable for homes than traditional wooden doors which can shrink and warp under different weather conditions. uPVC doors are extremely low maintenance and can be wiped down easily with a damp cloth. In addition to this, uPVC doors are resistant to mildew, mould and insects. Bi-folding doors are ideal for those wanting to open up their living spaces at the back of a house. They are also ideal for connecting kitchens, living rooms, dining rooms and more. Bi-folding doors are available in a range of different materials (such as wood and uPVC), however aluminium bi-fold doors are the most popular and recommended option due to durability and performance standards. In addition to this, it is also the most widely recycled material! Aluminium bi-fold doors are both lightweight and strong; aluminium frames, unlike wood, are resistant to twisting, expanding and contracting under various weather conditions. They are aesthetically pleasing, offering unparalleled natural light into your home and connecting the inside of your home with the outside without restricting any views. Bi-fold doors are also very energy efficient and can come in a wide variety of different styles. Patio and french doors are ideal for small to mid-sized entrances, adding a touch of elegance to any home. French doors are, traditionally, hinged double doors that open outwards. The main benefit of french doors is that you have access to the entire width of the opening. Sliding patio doors allow you to achieve much wider opening spaces and are extremely beneficial for properties with restricted space. Both options allow natural light into your home and do not restrict garden views. French and patio doors are energy efficient and will keep heat in your home during the colder months. Victorian doors, inspired by period architecture, usually feature ornate panelling and decorative glass styles. They add a traditional touch of elegance to any home. Georgian doors typically feature fanlights – either a rectangular or semi-circular segmental window at the top of the door. Contemporary doors are available in different styles; many have minimal panelling and geometric windows which look sleek and stylish. Did you know that in over 65% of burglaries, access is gained through the front door? It is extremely important that the doors you choose for your property, whether it is your home or business, are strong and secure. All of the doors discussed above provide high levels of security which is why we recommend them. In addition to choosing a door that offers high levels of security, it is sensible to consider additional security features to give you further peace of mind and to ensure that your property remains safe and secure against potential thieves and trespassers. Extra features that you can add include security cameras, effective locking systems (such as a digital keyfree lock) and anti-snap locking cylinders. The next step in choosing the perfect door for you is to work out the measurements. If you are buying a replacement interior door, do not measure the existing door; instead, measure the door frame. As a general rule of thumb you should take three width measurements: at the top, the middle and the bottom. The widest measurement will determine the width of your new door. To work out the height of your new door, measure the inside of each vertical side of the frame, remembering to take any floor covering into consideration. Many reputable door companies will come to your home and measure your new door themselves to ensure the best fit possible. Following this, they will provide you with a quote. The Window Centre is Harrow and Pinner’s leading door installation specialists and have been providing and installing high-quality doors for over 25 years. Our experienced and skilled team are able to provide you with all of the guidance and support you need when choosing the perfect door for your property – whether you are a small household or a large business. We provide entrance and patio doors in a wide range of different styles – from modern composite doors to classic hinged doors. 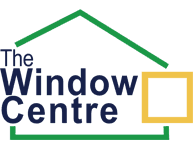 If you are looking to open up your property with bi-fold doors or an elegant pair of French doors, our team at The Window Centre can assist you. We offer a comprehensive range of personalisation options, tailoring our service to meet your requests. As a member of the Energy Efficient Homes Group (EEHG), our high-quality products will help you to save money while increasing sustainability.  At The Window Centre we also supply a wide range of windows, porches and frameless skylights. To find out more about what we offer, either visit our well-stocked showroom in Harrow or get in touch to request a free quote today.